Hi everyone! 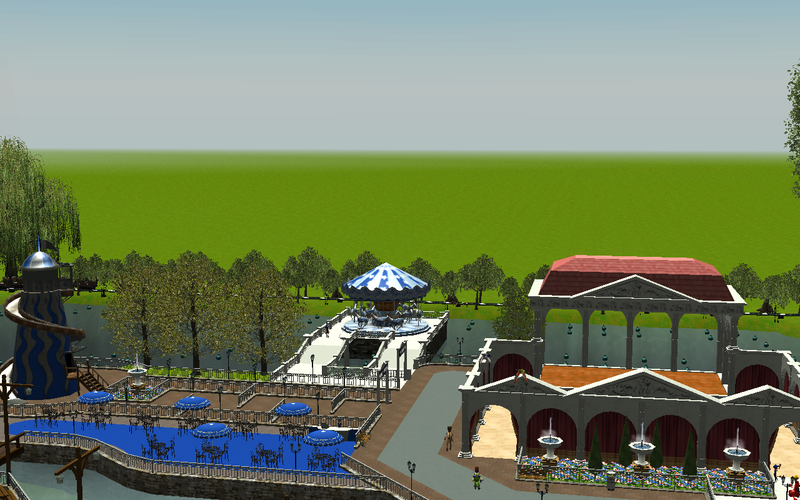 I am so sorry I haven't posted in ages, but I've been still very active with various RCT3 projects. After many fits and starts, I have a new WIP project that is almost ready to share with all of you. While I'm not quite ready to share the park name or details, I'll drop a few hints over the next couple days. Here's the first clue. Think you know what the park will be? Comment below! Re: New Project Coming - What Could it Be? "Love is an open door" Arendelle. Frozen themed park? Funny, but I started an Arendelle park and just kind of ran out of creative ideas for it. I did like how the entrance area which was themed to Arendelle village turned out though. Playing around with Norwegian and Scandinavian architecture is really fun. Hmmm, you got me stumped. Disney's America? The park that was never built. That's a picture taken in Philadelphia Pa of the "LOVE" statue...Disney Park in Philly? JB got it! The project is Disney's America! I'm hoping to post some screenshots this weekend. 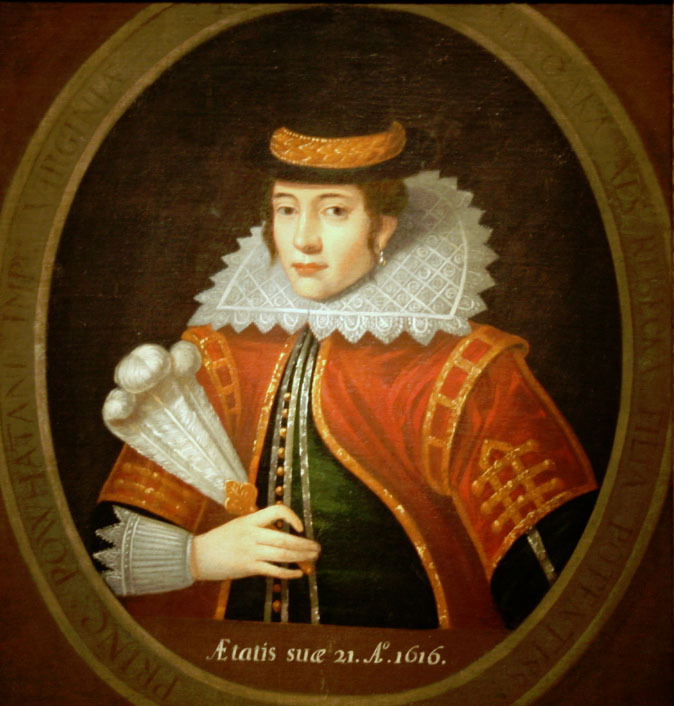 For those of you who are curious about the previous clues, Clue #1 was the Deleware River, Clue #2 was the iconic LOVE sculpture in Philadelphia, and Clue #3 is a portrait of Pocahontas. 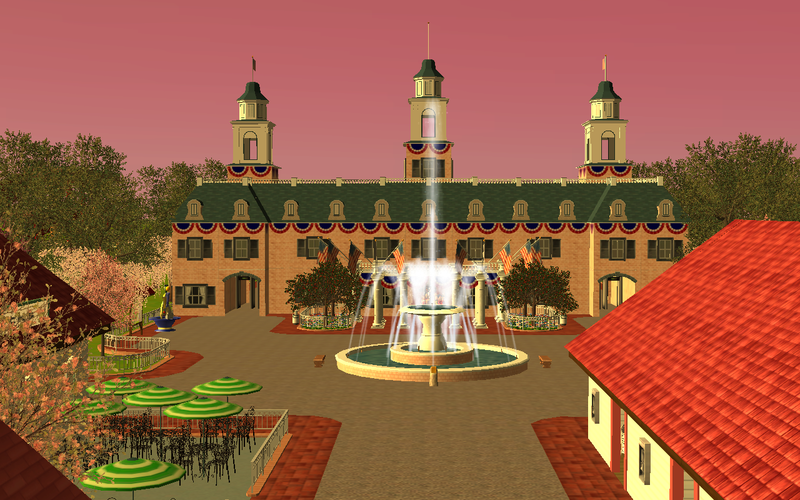 I worked on my Disney's America recreation for over five years! Best of luck with your recreation! I'm looking forward to seeing what you come up with! I remember stumbling on your thread a while back, and it definitely inspired me to take a crack at this project. Thanks for the inspiration! Awesome! I look foreword to seeing how this turns out! 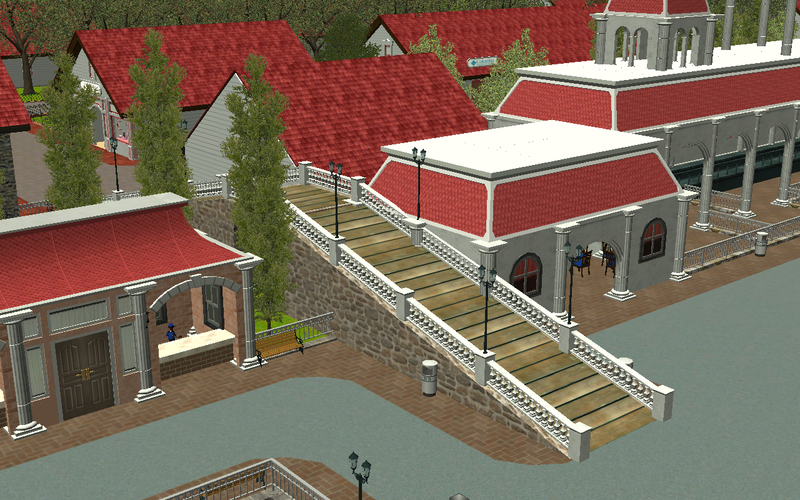 As promised, here are the first images from my current work in progress, Disney's America Resort. At 1000 acres--double the size of Disney's Animal Kingdom--Disney's America truly is a multi-day resort in its own right, and no Disney Resort is complete without a shopping and entertainment complex just outside the park gates. With that, I proudly introduce MOUNT VERNON MEADOWS. Inspired by the estate of George and Martha Washington, Mount Vernon Meadows features shops, restaurants, and entertainment offerings to park guests and casual visitors. Think of Mount Vernon Meadows as Disney's America's answer to Disney Springs at Walt Disney World, Downtown Disney at Disneyland Resort, or Disney Village at Disneyland Paris. Guests entering Mount Vernon Meadows from the main entrance to the south will first come to this grand, Colonial style building. Guests will pass through a security checkpoint as they enter the building. A courtyard with a beautiful fountain greet guests on the opposite side of the security building. From here, guests can visit any of the four themed mini-areas found in Mount Vernon Meadows. If guests travel down the path to their left, they will come to The Potomac Riverfront, which includes several activities and entertainments guests can enjoy for a small fee. These include rowing boats, a grand circle train trip around Mount Vernon Meadows, an amphitheatre, a lighthouse slide, a merry-go-round, and a hot air balloon. If guests veer to the right instead, they'll enter the Mount Vernon Entertainment District which includes a six-screen movie theater and a small waterpark. Guests who take the northern path directly in front of them will experience the Mount Vernon Shoppes. 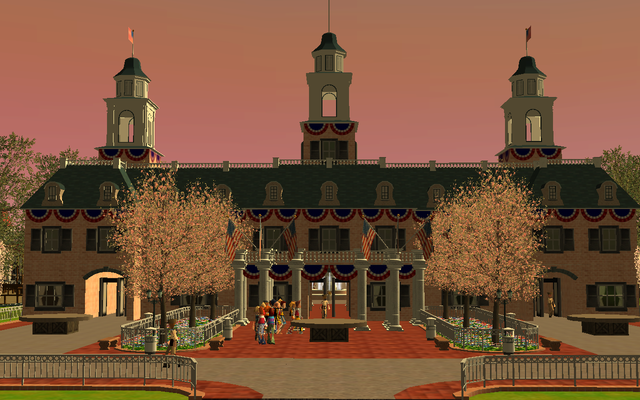 Further to the north is the Mount Vernon Hotel and the main entrance to Disney's America Park. For today's update, we'll take a look at some of what The Potomac Riverfront has to offer. As guests walk towards The Potomac Riverfront, they'll first get a glimpse of Eagle Eye Balloon Flight. From Eagle Eye Balloon Flight, guests get an incredible view of The Boathouse restaurant, the Mount Vernon Express railroad station, Potomac River Rowing Boats, and more. 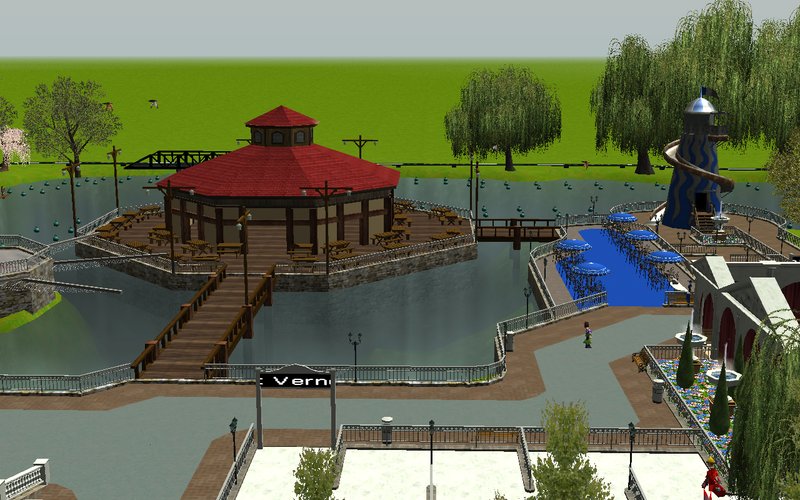 Further down the path, guests will find the Potomac Point Lighthouse slide, the Mount Vernon Merry-Go-Round, and the Mount Vernon Amphitheatre. Wow, all this and we haven't even entered the park yet. I especially like the late afternoon balloon pic. A closer view of the Mount Vernon Amphitheatre. Guests enjoying a ride in the Potomac River Rowing Boats or the Mount Vernon Express get quite close to the back and side of the amphitheatre. Near the amphitheatre is a small area nicknamed the Amphitheatre Promenade. 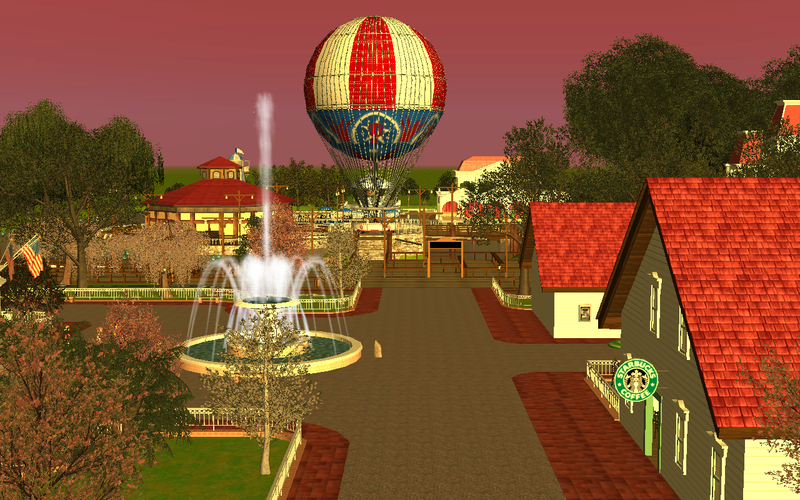 Here, guests can find some take-out counters serving burgers and such, as well as restrooms, an ice cream kiosk, and a balloon kiosk. A bridge near the Amphitheatre Promenade connects the Potomac Riverfront area to the Mount Vernon Shoppes. On the opposite side of the bridge sits a station for the Mount Vernon Express, a train that runs throughout Mount Vernon Meadows and connects it's many areas. Nestled between the train station and the bridge is a small restaurant, Engine Company Sandwiches. A closer look at The Boathouse restaurant and the Potomac Point Lighthouse slide. Tomorrow, we'll venture into the Mount Vernon Shoppes! Thank you! I love the pic of the balloon as well. 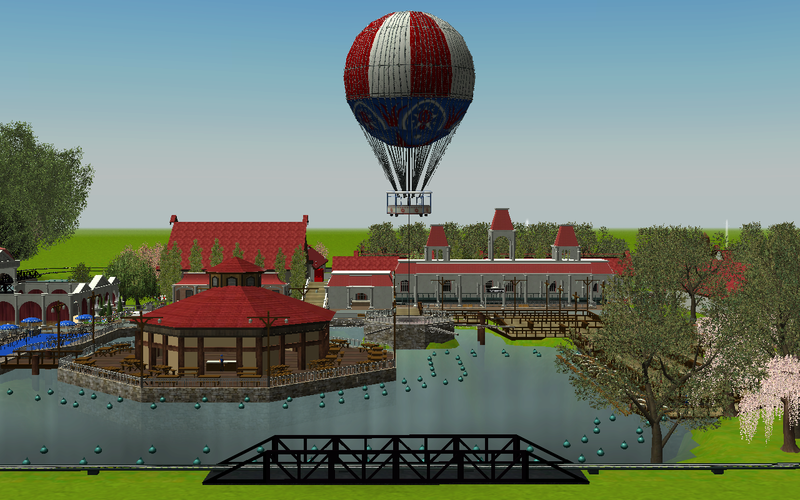 Every time I look at it, I imagine what the park would look like from the basket of the balloon. Looking really good so far! 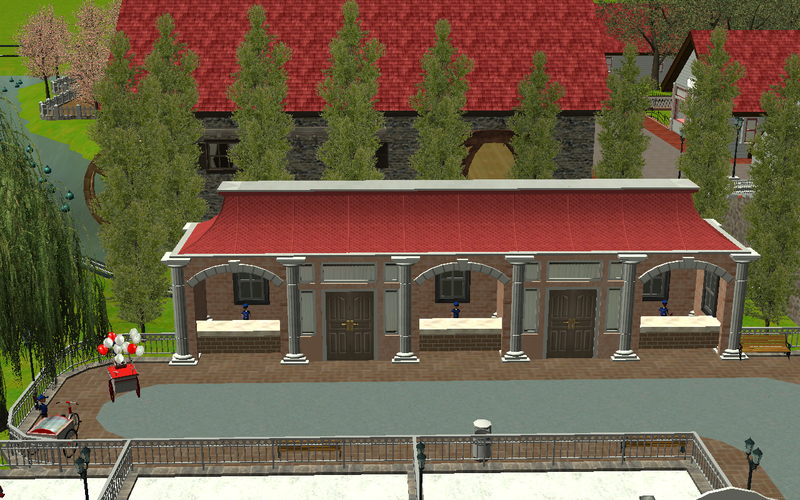 Love the colonial style entrance building and all the details added to it. 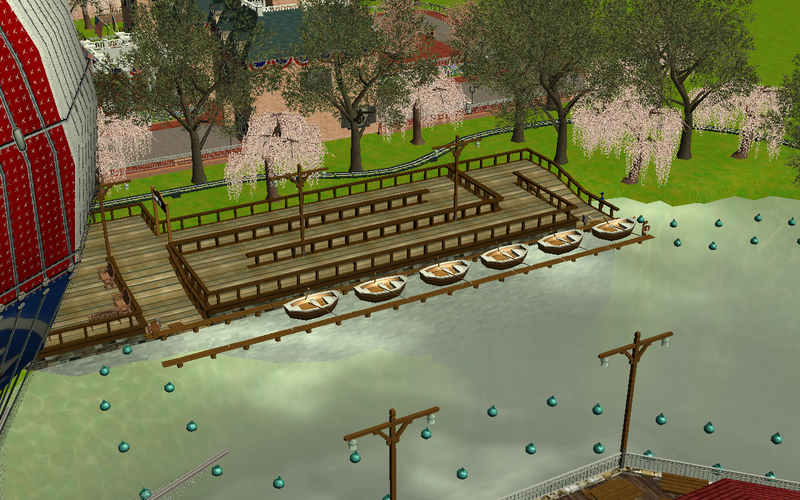 Just one suggestion I have is if you add some kind of fountain in the body of water that includes the Boathouse and the rowing boat ride. I feel that would really complete that area for you. Thanks for the compliment. 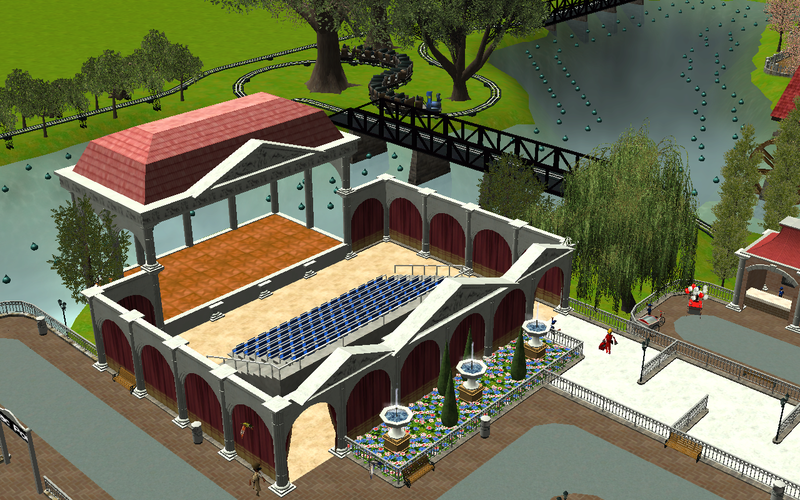 I actually started with the building in OldSpice's American Adventure set, but it wasn't quite as wide as I wanted for the footprint I had in mind. So I spent hours building something from scratch based off of OldSpice's design, and I really am pleased with the result. Regarding your idea of a fountain, that's an interesting idea. I'm a little wary of putting a fountain inside of a body of water because it always makes the body of water look manmade. Granted, this one is, but I want it to look like it could be a natural body of water. Maybe a waterfall or two? It would be kind of cool for the train to pass by or under a waterfall. 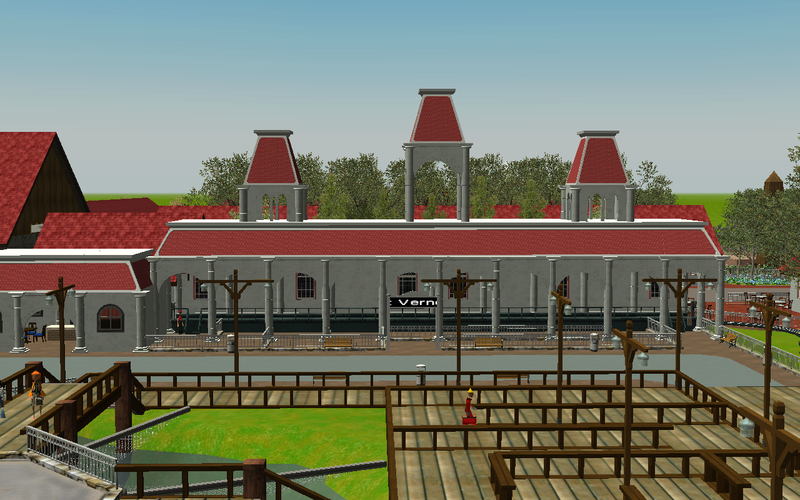 I like how the train station is enclosed, but with the front left open. That way, you get the beauty and elegance of the building plus you can see all the movement and interaction as the peeps board and exit. Thank you! It initially had a wall but I quickly got rid of it for that exact reason. The open design gives it a unique kinetic energy, and I liked the idea that if the station were left open, guests could still enjoy the view of the waterfront while in line. This looks fantastic! Beautiful job! Thank you both! I am such a huge fan of each of you, so your messages just made my day. As you can see, Disney's America will host 28 lands, organized into six areas (similar to how EPCOT's Pavilions are part of either Future World or World Showcase). Now that I have an idea of your vision the waterfalls would definitely make more sense. I could easily see some rockwork with waterfalls and some trees really complete the area under the bridge. Further adding to the theme of the area very nicely. I agree. I hope I can make this change soon. Will post some pictures as soon as it's done!